It really annoys me when I hear people describe any consequence a student receives as punitive. Hey, I agree that punishments are punitive (there’s a clue in the name after all) but consequences, if done right, simply aren’t. We do our young people no favours by letting them think there are no consequences for their actions. We all know there are. We do however, do them a disservice if we expect to modify their behaviour in the same way you might choose to do so with a rat. 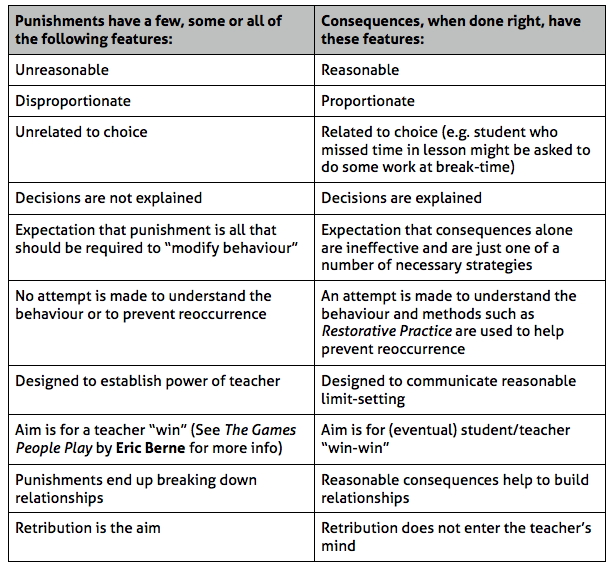 I think when you put all the features in a table, the difference between punishments and consequences becomes obvious. My plea (and I realise I may preaching to the converted here) is that we do not throw consequences out with the old punishment bath-water. If we do, there will be consequences.